Makes 20 servings, 1 piece (90 g) each. Prepare cake batter and bake in greased foil-lined 13x9-inch pan as directed on package. Cool completely. 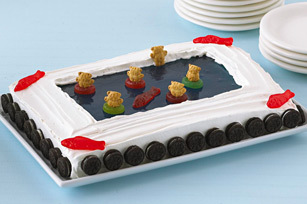 Invert cake onto large platter; remove pan. 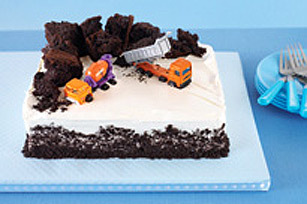 Use serrated knife to cut 1/2-inch-wide strip off each side of cake. Cut each strip lengthwise in half; set aside. Spread cake with 1-1/2 cups Cool Whip. 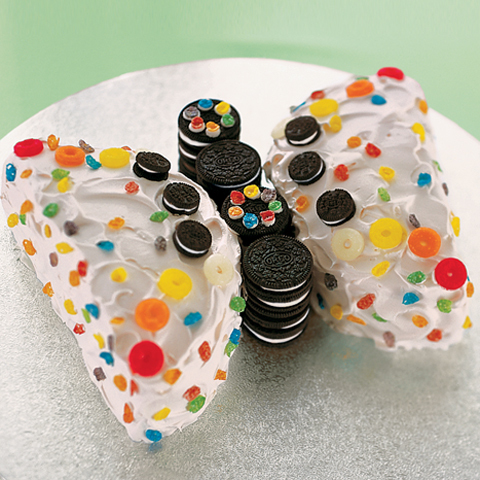 Stack cake strips around edges of cake to make rim; frost rim with remaining Cool Whip. Refrigerate until ready to use. Add boiling water to dry jelly powder in large bowl; stir until completely dissolved. Add ice cubes; stir until jelly begins to thicken. Remove any unmelted ice. Pour thickened jelly into centre of cake. Refrigerate 4 hours or until jelly is set. 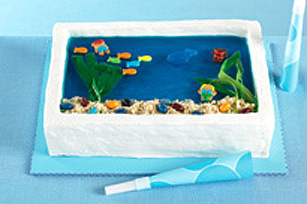 Decorate with remaining ingredients to resemble aquarium. Keep refrigerated. 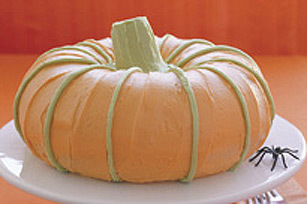 Cooking Know-HowMake sure cakes are completely cooled before frosting. A warm cake can cause the frosting to soften or melt. Easy CleanupLining the pan with foil makes for easy cleanup and easy removal of the cake from the pan. When lining the pan, allow 3 inches of the foil to extend over each side of pan to use as handles when removing the cake from the pan.